I wanted to solve a simple problem - remembering recommendations for movies, books etc. I observed that everyone had an individual way of augmenting their memories, such as noting movie titles in their notes app, or in a to-do list. Researching the issue, there was agreement that none of these solutions were perfect, and there was real enthusiasm for a better option. I began thinking about the power of making the app social, allowing you to follow friends' intended reading or watching lists. Since you'd likely trust their taste, there would be compelling potential for tailored content discovery. My original wireframe concept was a website, but I quickly decided it needed to be 'mobile first' as it best suited the context of use - that moment where you want to ensure you don't forget a title mentioned in a conversation. My colleague starting prototyping a mobile webapp using jQuery mobile. Before long I'd convinced directors at Albion London to give us time to design and build it a little more formally on company time. 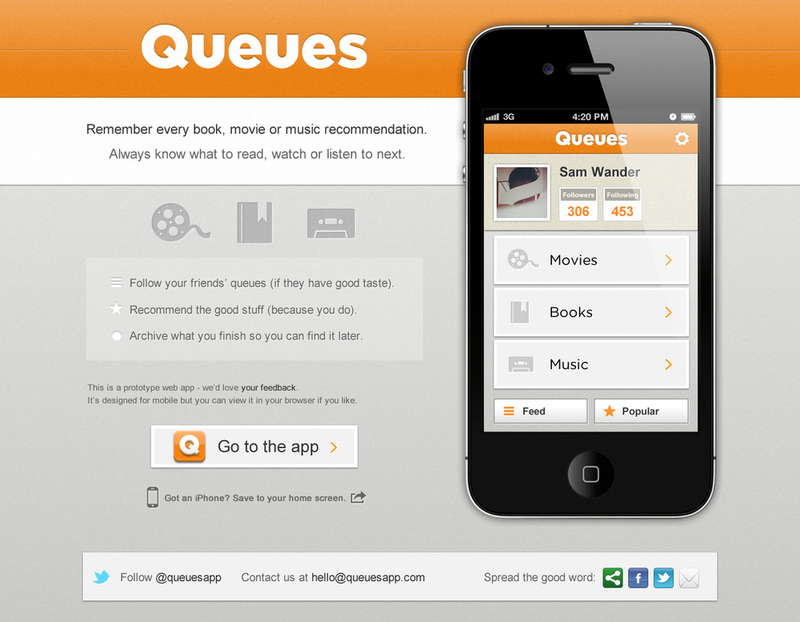 We launched a webapp just in time for SXSW. It received great user feedback, there's been a lot of support for the idea. Unfortunately the project was paused at this point. If you're interested in helping me progress the idea send me a message.